A major issue with creating successful change is that people must create new habits. Something like 70% of the way we work is habit so if we want to change we need to understand what habits are and how to form new ones. When we first decide to do something new – like not checking our emails every five minutes, regularly going to the gym or applying a new skill we’ve learnt in a workshop – we’re taking action. It’s intentional, rational and goal-directed. 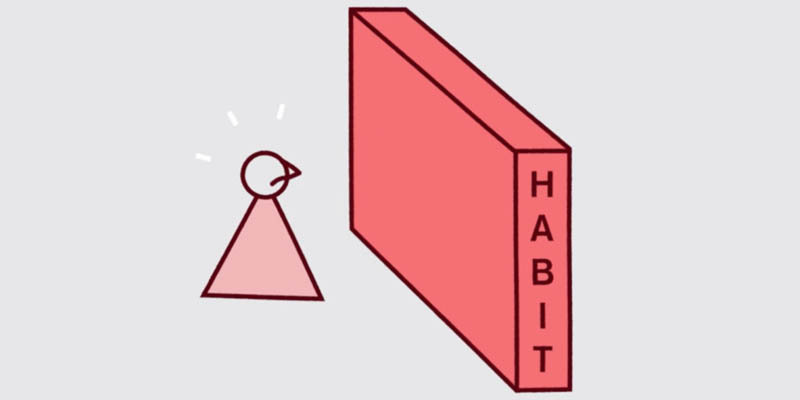 Habits, in contrast, are characterised by automatic behaviour: we don’t have to think about what we’re doing every time we do it. Our intuitive assumption is that actions become habits when we repeat them. But is just repeating an action enough? Our intuitive assumption is that actions become habits when we repeat them. But is just repeating an action enough? One metaphor used to describe a habit is that of a neural pathway that has been reinforced through repeated use. You might think of it as a footpath that’s been used so often it’s now a deep furrow in the ground. The depth of this well-walked rut makes it difficult to get off the pathway – to break the habit. This footpath metaphor makes intuitive sense; the more you do something the more likely it is to become a habit. But that’s not the whole story. When we’re talking about the technicalities of brain function, actions and habits are very different things. They use different parts of the brain that respond and work in different ways. The two systems are called the Reflexive and reflective systems or systems 1 and 2 to use Daniel Kahneman’s terminology. Lets take the example of learning to drive to illustrate how the two systems work. When you first learn to drive you mainly use the Reflective system, system 2. This system is mainly run by the prefrontal cortex and is slow and energy hungry. It is used for goal setting and deliberate behaviour. When acting through this system you are consciously aware of all your actions and thoughts. You are deliberate and slow in your actions. Once we are experienced you shift to the Reflexive system, system 1. Using this system you are able to get from home to work without even thinking about it. This system is mainly run by the basal ganglia, it is automatic, quick and largely unconscious. When you drive in unusual circumstances like a new car or when you are abroad you will have to engage system 2 again as you will be driving on a different side of the road or in an unfamiliar car. To illustrate this difference between the 1 system and 2 system Kevin Ochsner uses the metaphor of the trusty, faithful dog and an absent-minded professor. The faithful dog can be relied on, never gets tired but is not that smart or imaginative. This is the metaphor for system 1 Whilst the professor is brilliant and can solve complex problems but finds it hard to focus on one problem at a time and will dart from one thing to the next never quite completing the activity – This is a metaphor for the system 2. Understanding how and why they‘re different can help you change your habits and help you to help others to change theirs too. It can even be useful when it comes to changing the habits of groups of people – or even a whole organisation. Most of the research suggests a three-stage process for creating new habits. Most of the research suggests a three-stage process for creating new habits. 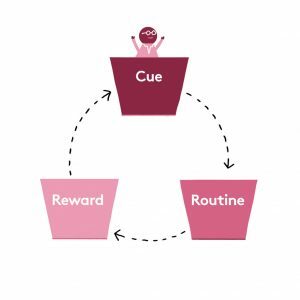 It involves developing a plan that contains a cue, a routine and a reward. Many studies have shown that a cue and a routine on their own aren’t enough for a new habit to last. Only when the brain starts expecting the reward will it become automatic. Ideally your cue, in addition to triggering your routine, should also trigger a desire for the reward. We have a short animated video that works through an example for you on the web site. Identify a trigger, something that will remind you to take the action you plan, your new routine. The cue may be a time, a person or a preceding action or a place – as in the video example. Cues work when they’re linked to something you know you’ll do anyway. They work even better when they also trigger the anticipation of the reward. So in our example the first conversation you have triggers the sense of control that you like and feel rewarded by. This encourages you to continue to talk to other team members. Define the steps you’ll take. These are the specific actions that you’re trying to turn into a habit. This might be walking around and talking to the team for at least two minutes. The more detailed you are when defining these steps the more likely you are to carry out the routine – and it’s a good idea to start with small goals and then build on them over time. A reward is essential to turning a new behaviour into a habit. The best rewards are neurological and it’s even better if there’s a sense of real anticipation. That way you get the benefits of the actual reward as well as the good feeling that comes with knowing that the reward’s on its way. This is where the cue, routine and reward help, but you also need a plan of what to do if things don’t work out quite as you’re hoping. The conventional wisdom in many businesses is that if people understand rationally why they need to do something then they’ll get on board with it. This just isn’t the case. This is where the cue, routine and reward help, but you also need a plan of what to do if things don’t work out quite as you’re hoping because sticking to the new routine can be thrown off track especially when we are tired, stressed or distracted. There is a bit of a debate amongst researchers as to whether we fail to persist with new habits because of a lack of glucose for the brain, or our beliefs. The latest research by Elliot Berkman at the University of Oregon examines the evidence on whether willpower is based on resources like glucose and says that, rather than a depletion of glucose governing our willpower, it’s actually a change in our motivation that makes the difference, as people unconsciously or consciously calculate opportunity costs over time. Berkman is proposing that your motivation and the amount of effort you are therefore willing to exert change as you go through the process of forming the new habit. These changes in motivation mean you may give up before you complete the habit formation because the reward seems less desirable. For example, social learning communities can help learners support each other to adopt new behaviours. Groups create accountability and belief and keep motivation high, all of which are crucial in helping you stick with new habits. The more you can stay motivated or have someone help you through positive reinforcement, the easier it’ll be. Nascent habits, no matter how well supported, are easily broken, so it’s as well to be prepared for when you lapse. Dan Ariely, a behavioural economist at Duke, calls this The ‘What-the-Hell’ Effect. Imagine the scenario. You’ve been incredibly disciplined about getting to the gym each day, but today you miss a session. Or you’ve been making time to walk around the team each morning but yesterday you were late and didn’t do it, and today you forgot. It’s tempting to think, “What the Hell,” and give up on the whole thing. So now you’re ready to trash the whole new habit plan – it’s obviously not working – and not only do you skip your gym session or talking to the team but you eat chocolate biscuits all day too. Just because. So the message is this: Have a good plan. Make sure there are anticipated rewards that are cued regularly. And don’t beat yourself up. David Rock says you can only really work on one or two habit changes at once. We’d suggest that you avoid trying to develop two habits in the same area too. That means don’t try dieting and giving up smoking at the same time. It’s likely to be too difficult, and you’re setting yourself up to fail. Generally speaking, it’s best to focus on one new habit and get that running smoothly before attempting the next. It can be, however, a good idea to choose a habit that can make another overlapping habit easier to take up. For example, if your plan is to make a greater contribution in management meetings and you also want to improve your facilitation skills, you can practice both at the same time by facilitating the flow and objectives of the meeting while making an effective contribution. In change we sometimes need to temper our optimism with a pinch of realism. It’s true that the biggest predictor of success in achieving a new habit is self-belief – that confidence that we can achieve what we set out to achieve. Having said that, it’s important to be realistic about which things will be particularly difficult and to have a plan to overcome those difficulties. This means not underestimating the challenges. Most changes require time, planning, effort, and persistence. Take the study conducted at New York University, for example, that showed that those who thought it would be hard to lose weight proved to be more successful and lost nearly 11kg more compared with both the control group and those who thought it would be easy. The participants who thought the target was easily achievable actually gained weight. So before you crack on with a new habit, picture what success is going to look like and how it’s going to feel. Make sure you’ve got the right mind-set. Make sure you’ve set up your cues, routines and rewards clearly, and don’t forget to balance that vital self-belief with some cold, hard realism. Whilst the science can’t tell you how long it will take to embed your new habit, you need to celebrate your successes along the way and not beat yourself up if you have the odd slip. And when your cues change, like when you change jobs or when you are on holiday, make sure you’re especially vigilant. That’s when the old ways of working can creep back. Remember, it seems like the habits that are good for us can be the hardest to form but maybe that’s about belief! See yourself creating and embedding those new ways of doing things. And be proud your new self!